IT was knocking on for three in the afternoon and we still hadn’t thought about lunch. Scrabbling around on the side of a hill, overgrown with long rye grass and raggedy unkempt olives, I felt like a kid in a sweet shop for the first time in years. Hot? Yes, but it was just as the local archaeologist had described it: Topped with a medieval castle, now in ruins, and with a river running beside it, the hillside was literally one big burial ground full of Roman artefacts and pottery. Not a sign in sight – nor a fence to stop you wandering in – we were soon crunching over ancient fragments of porcelain mugs, bowls and olive vats, known locally as anforas, some still adorned with the burgundy red paintwork typical of the times. Incredibly, this is one of hundreds of practically undisturbed archaeological sites in the area known as La Campiña, basically a huge rolling plain that sits between the celebrated cities of Sevilla and Cordoba. This should not come as a surprise though, for the key towns of the Campiña sit near the Via Augusta, that in Roman times was one of the busiest highways in the world. For nearly 2,000 years the shifting grains of civilisation – from the Romans to the Moors and from the Vandals to the Visigoths – shunted armies and plied their trades along what is now more commonly known as the A-4 national highway. Largely an area of rolling agricultural land, loosely following the course of Spain’s Guadalquivir river, few people stop to even ponder the importance of this route as hey bomb along at 110 k/ph between the two principle Andalucian cities. Moors the pity. For, as logic prevails, this 60-mile expanse of prime farmland bequeaths one of the richest tapestries of historical remains and settlements anywhere in the world. Practically unknown even here in Spain, the towns of Ecija and Carmona, as well as nearby Osuna, Marchena, La Roda and Palma del Rio are delights, which for their size are all the more remarkable. Full of grand townhouses, expansive archaeological sites and, best of all, a staggering large number of charming boutique hotels, they are in many ways more impressive than their famous big sisters either side. 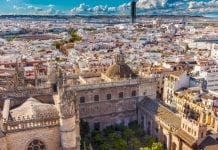 Even better, you won’t find yourself shoulder to shoulder with tour groups, or barked at by tourist-weary waiters, as is often the case in Sevilla and Cordoba. Ecija is particularly fascinating by virtue of its geography. For the city of 42,000 people is often described as the hottest in Europe – frequently the hottest in the world – due to its location in a dip in Spain’s steamiest region in summertime. Termed the ‘frying pan of Europe’, the mercury occasionally hits 52 degrees (126f) in summer, when it is said you can fry an egg on its pavements. The truth is, apart from a very few days when the Terral wind comes from the Sahara to the south, the place is actually quite bearable . . . and indeed designed to deal with the heat. It’s narrow streets keeping out the midday sun as best as possible and its buildings mostly designed around leafy courtyards with fountains and other water features, cooling the air down. The heat however, is a red herring, for Ecija should really be best known for its palaces and a series of Roman finds – mosaics, plaques and statues – which are said to be the envy of Italy. On one celebrated dig, a statue, known as the Amazona, emerged two Millenium later without even a scratch. Sometimes called the City of Towers, Ecija (pronounced Ess-i-ha) has the feel of a mini-Sevilla, its cobbled streets full of atmosphere and equally attractive buildings. It has its fair share of palaces, more than two dozen, one the Palacio de los Granados, which is now a hotel. To sit in its pretty patio is to be transported back 200 years. Best in the spring or summer, in the heat, with the ever present sound of water trickling from fountains and into the stylish alberca-style pool. Its rambling roses, bougainvillea and jazmine running riot, the smell of orange blossom almost overpowering. Our tour along the so-called Roman Route of Betica was an incredibly easy drive; the roads are good, the terrain gently rolling, and the six towns on our journey were no more than half an hour apart. But don’t expect to be blinded by breathtaking scenery. The Campiña is actually rather flat and treeless, basically full of wheat, making this the breadbasket of Southern Spain. But under a cobalt blue Spanish sky, our spirits were up, as we approached Carmona. Built on an easy-to-fortify escarpment, Carmona is best approached from the Eastern Cordoba exit. Taking you up past the Puerta de Cordoba, a mish mash of Roman, Moorish and Renaissance styles, you are immediately in the beautifully preserved old town. Look for the signs for the Casa de Carmona hotel, a 16th century nobleman’s house, which is a great place to have a poke around and the best spot to leave your car. Already a favourite among the English-in-the-know the chips on the paintwork give it that genuine feel of a cash-poor aristocrat. But it is very charming nonetheless. From here step out into the Middle Ages, the windy streets leading to leafy squares and some of the best restaurants in the region. It was no surprise to discover that Carmona is one of the oldest towns in Spain, being the site of human habitation for over half a million years. A vast site of thousands of tombs, many you can climb down into, and including one which has a small elephant statue, it kept us occupied for much of the morning. From here we were off towards Palma del Rio, another ancient town, right by the Guadalquivir river. I’d done my reading, in particular a recent book by American historian Mary Lee Settle, which really put the river and route in perspective. It had been right back in 152BC when Cordoba was the biggest city in Europe. It ruled over Betica, the richest province in the Roman Empire, providing Rome with most of its olive oil, as well as wool, wheat and copper. A little further downstream, Santiponce, near Sevilla, is even older having been established after the Romans sent the Carthaginians packing at Italica in 206BC. Its broad paved streets once boasted an amphitheatre for 25,000 spectators – still an incredible place to visit today – and it was the birthplace of two emperors Trajan and Hadrian. Both later became important Moorish cities, with Cordoba in the 10th century becoming the heart of the Islamic Empire, said to boast 3,000 mosques, 80,000 shops and 900 public baths. By the 16th century Sevilla had finally taken over in size and importance, thanks to its monopoly on trade with Spain’s colonies in the Americas. 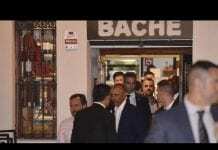 But it is perhaps in the interim – between the 11th and 15th centuries when the Arabic Moors ruled much of Spain – that the area became so revered. 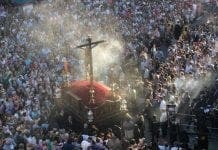 A time of chaos and Christian fervour, it became almost as sacred as the Holy Land when the Pope announced a crusade ‘to fight the infidels’ in Spain. Heralding enormous bloodshed, bands of Knights Templar rode to Spain to try and clinch back the Muslim country for the Christians. 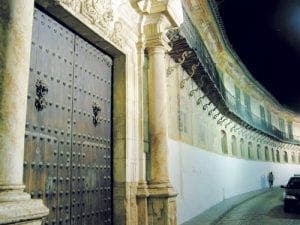 By the mid-13th century both Sevilla and Cordoba were in their hands. Most of what fell in between became a shifting line of anguish, with the Kingdom of Granada and its outposts of Ronda and Antequera somehow staying intact for a further two centuries. It is difficult to get a sense of those violent times as you head along the sleepy backroads that meander through the La Campiña region. The countryside, which became so valuable to Spain in the days of Empire, gently rolls with crops of corn, wheat, olives and oranges. This is certainly the Andalucia of legend; Day labourers, so famed for the region, still sit around in the shade drinking beers until summoned to work. Storks make their nests on steeple tops. Lizards hop off kerbs, and scattered around are numerous white-walled cortijo farmhouses, many in ruins, with lines of proud palm trees hinting at happier times. You are here though for the towns, with Marchena, Posadas and Almodovar del Rio all springing surprises, while Osuna is a gem of significant proportions. During Roman times, Urso, as it was known, was well connected and there was great wealth made here from olive oil in particular. But it had been a key strategic place since Iberican times, a fact easily proven by its huge (and sadly rather neglected) necropolis burial site that can be found a five minute walk above the town. While important in Roman times it was in the 16th to 18th centures that it truly thrived. 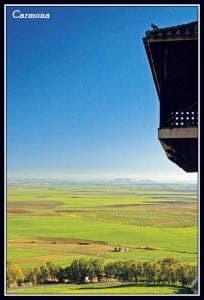 Then sitting at the heart of the richest agricultural region in Spain, many of its farmers had been enticed in from abroad, from Germany and France, with the promise of land and livelihoods. The Bourbon revival under Carlos III brought investment to the deserted countryside. Trade was booming with the Americas, via Sevilla. Its aristocratic families, in particular the Dukes of Osuna, were among the richest in Spain and profligate builders, endowing the town with a dozen convents, renaissance palaces and, the crowning achievements, the Collegiate and University. Osuna is said to have a higher concentration of palaces than even Venice or Vienna, and walking down the grand Calle Sevilla, it is hard to argue; its facades are some of the most intricate I have ever seen, one the Palacio del Marques de la Gomera, conveniently now a hotel. From here, on the advice of the local archaeologist, we were up early on a fascinating tour of the rustic hinterland. Taking the road to the village of El Rubio (meaning The Blond, and testament to the Northern European farmers who once settled here), we had soon found our own private dig. As we sat in the remains of the medieval fortress – our pockets full of fragments – we imagined how this hill may have once been a Roman settlement with thousands of homes. Looking across the huge empty plain in the blazing heat, listening to the wind and the screech of a kite, we agreed this was the sort of secret spot that makes Andalucia such a wonderful region. And yes we did make lunch. This is Andalucia, after all, and at 4pm, we were not even the last to arrive.